Though I don’t like writing about where I work on my blog, I will mention that I work at Intel in Rio Rancho. I am part of that group (my department specifically) that could be laid off. It’s bad times right now and the worse is yet to come. Then, I read what’s going on in Los Alamos. The national lab town north of Albuquerque and are reminded how much worse it could be. The Los Alamos Labs are probably going to be having their own lay offs of a similar size to Intels. Yes they have a much smaller town and it will be difficult for them to absorb all the out of work people. This article in the Los Alamos Monitor highlights several issue with the new management that makes is sound even more bleak. 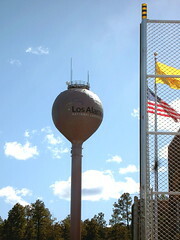 To put this story into a bit of perspective, the Los Alamos Monitor is the local company town rag. The editor of the paper, Ralph Damiani has traditionally been a complete toady when it came to publishing stories that even hinted at a point of view less than totally complementary towards LANL. He would spike any story that did not deliver glowing positive things to say about LANL and its management. That fact that this story ran is an indication of how complete the unhappiness with LANS is at Los Alamos.